Sometimes my tendency to make more out of some experience than it deserves, to expand a moment to metaphor irritates me. Even me. Still, I think of all experiences as part of some story; meaning some puzzle piece we haven’t found a place for yet. Not yet. 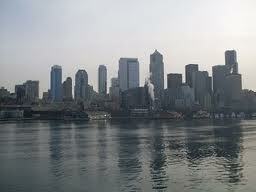 I occasionally work on ‘the other side,’ in the city, Seattle. In the Pacific Northwest, this is like a reverse surf trip. Still, there are more surf shops in Seattle than on the Olympic Peninsula, and more surfers as well. Cities are where the jobs are. It makes sense. And maybe it’s been too long since I lived in a city. The overload of competing stimuli strikes me even before it’s my turn to get off the ferry. My Google Map directions not quite memorized, I have the printed version in one hand, ready to take on the crazy traffic, always with someone who knows where he or she is going moving up quickly in the lane I may have to switch to. Instantly. And of course, it’s raining. The storefronts are passing quickly, sideways vision blurred. There are red traffic lights on clutch-burning hills, pedestrians, and heights, and reflections, and curtainless windows shining; and signs I have to read among those I cannot. All of it is too much. And yet the houses in the neighborhoods can seem deserted if not for the rain-coated landscapers raking and cutting; if not for the dog-walkers, plastic bag held in a plastic glove, each of them blind to some worker leaning into the side door of his van (though the dogs haven’t learned the city-posture, the ghetto-mentality, and sniff between the coffee and the paint on passing); if not for the occasional children who chirp like stellar jays at a freshly-filled feeder; if not for the car alarms and the whoosh of passing cars, and the sound of some ambulance siren, moving, moving, blocks over; stopping, evidently, but with the siren still going. That sound becomes something like seagulls on a rooftop; eventually. And yet, with the city humming like redundant jazz, I’m listening for the sound of the ocean, maybe remembering the excitement of the stimuli overload from my years in San Diego; taking cross streets and alleys to check the surf between PB Point and Crystal Pier, or dropping down the winding roads out of Mission Hills, hoping to beat a couple of traffic lights en route to Sunset Cliffs. Yes, I have been that guy moving up in the right lane, knowing where I was headed, annoyed by those who are overwhelmed. I will have to write something about localism as it has been redefined in the northwest. With Seattle a ferry ride and another two and a half hours of driving to get to pretty much anywhere on the Straits, and about two and a half hours of driving to get to Westport, depending on traffic… well, it’s like being a surfer who lives in Sacramento, maybe even Los Vegas. Okay, maybe Needles. Or, thinking from another angle, it’s like (checking the Google Map) living in Fallbrook, California, where I was raised as a suburban non-cowboy, and surfing 1), Oceanside Pier- 25 minutes, 2), Huntington Pier, one hour and twenty minutes, or 3), Malibu Point, two hours and a half; all depending on traffic (jams). So, this relates to me, now; as: 1), Port Townsend, 2) My favorite Straits spot, and 3) either the real coast near Neah Bay, La Push, or, in the other direction, Westport. There are other spots, kind of like Fallbrook to Swamis, or La Jolla, or, no, Tijuana Sloughs is probably Huntington-ish. Ish. Still, even if you live in Port Angeles, it’s over fifty miles to the real coast. This isn’t that story. And yet, I purchased my latest wetsuit at a Seattle surf shop, cruised through another one over by Gasworks Park. “Don’t touch that,” the guy working there said as I leaned in too close to one of their boards. “I live on the Peninsula,” I said. “Local-er,” I’m thinking. If I’d needed to, I would have added that I own land and live ON Surf Route 101. Not the local-ist, and I did once own a cowboy hat. Didn’t seem right. Oh, I’m still going here. So, I did see some legitimate locals late one winter day, on beyond Joyce. I got out of the water because it was getting too dark when two pickups pulled in, logging gear and surfboards in the back. “Doofy has to go out because he missed it this morning,” the guy in the first truck said. As Doofy (might have had a different nickname) suited up and paddled out, I talked to the local logger/surfers. “Well, there are so many spots,” he said. “Really? Where?” He looked at me. Owning a house on Surf Route 101 wouldn’t have helped at all. “Nevermind,” I said as Doofy cruised across a dusky left. This entry was tagged real surfers, Seattle surfing, Surf Route 101, surfing localism, surfing stories, surfing the Straits of Juan de Fuca, surfing Westport. Bookmark the permalink.